Danger High Voltage has been a very successful slot for Big Time Gaming. They’ve just recently released a sequel to it called Danger High Voltage 2: The Final Countdown. The new edition offers more features, while still retaining the same qualities that made the first game such a hit. Keep reading to find out more on what makes Danger High Voltage 2 a worthy sequel. This game takes place in a futuristic world. It offers an electrical grid and a city in the background. You’ll also see a space shuttle to the left of the reels, which indicates some sort of astronaut theme. The electrical grid and city combine to offer a very entertaining atmosphere. The various lights hovering around also help create more excitement while you play. Danger High Voltage 2: The Final Countdown features six reels and 4,096 ways to win. You can bet anywhere from €0.20 up to €20 per spin. The return to player (RTP) for this game is 96.65%. Reel Clone – Active in the four middle reels, this feature can clone reels and allow for more matching symbols. Clone Wilds – Any wild that lands on clone reels will create a clone wild. This wild symbol can expand to cover up to four reels total and offer a 4x, 27x, or 256x multiplier. 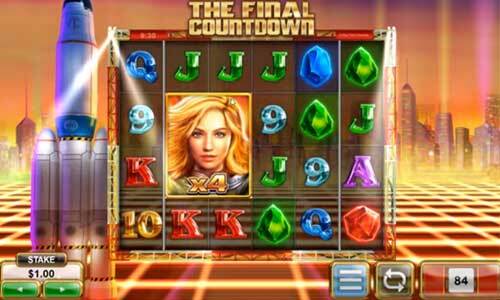 The Countdown – 8 free spins that feature a 2x2 multiplier wild. This multiplier moves across the reels during each spin (a.k.a. roaming). If the countdown comes down to zero, the wild increases to 3x3 and so on. This bonus have the biggest potential to really win big. Heading for Venus – 15 free spins, with Reel Clone and up to an 888x multiplier being included for every spin with a wild. The first Danger High Voltage game is definitely good and its one of our favourites. We love the sticky wild bonus in the first one. However Danger High Voltage 2: The Final Countdown offers plenty of fun features that can lead to huge wins. The only players who won’t like these features include those who desire simplistic online slots. Anybody else will really appreciate all the extras that are available in this game. You can play Danger High Voltage 2: The Final Countdown online slot for fun here on its releaseday, play Danger High Voltage or other Big Time Gaming slots for fun until then.